Wrist watches, bracelets, bangles and cuffs are all ways of adorning the wrist. You may choose something that complements your outfit or something that provides an unexpected contrast. Some women with a classic style choose a simple chain or watch if they decide to adorn their wrist. A bracelet can add personality to what you are wearing and can be practical, inspirational or just a bit of fun. When I am catching public transport I wear a watch to make it easy to keep an eye on the time. I have two watches but the one I wear most often belonged to my mother. I think of Mum when I wear it. It has easy to read numerals and a stretchy wrist band so it is practical as well as sentimental. Some of my bracelets hold special memories. A pearl bracelet reminds me of a holiday in Broome. Another bracelet, with four different coloured 'stones' makes me think of a pleasant morning I spent exploring Goodwood and taking photos. I bought the bracelet at a lovely gift shop where I chatted to the owner. There are a couple of silver bracelets given to me by a close friend. I have numerous bracelets in different colours, materials and designs. Sometimes I wear two or three bracelets together. I might choose to wear two which feature pearls together. Another day I will wear three that have the same design but are in different colours together. I like this look but it's not very adventurous. These days it is quite the fashion to wear a stack of bracelets. I had a look on the internet to pick up ideas for wearing a number of bracelets together. I saw ideas for heavy chunky bracelets worn with one or two daintier chains. In a couple of places I noticed the model was wearing nail polish in a colour that matched one of the bracelets. This looked effective and is something I might try. A bracelet can provide inspiration. I have two silver bracelets with inspirational words on them. Sometimes the inspiration isn't as obvious. I love butterflies. They symbolise freedom to me. As well, they remind me to live every day because life is short and shouldn’t be wasted. There are bracelets that can be personalised. Some women like to get the type of bracelet designed for adding charms of their own choice. I don’t have this sort of bracelet but I have added a few charms to bracelets in my collection. Those who enjoy craft may decide to make their own bracelets. Kits can be bought from craft shops or online. Look on the internet for instructions and inspiration if you would like to make your own bracelets, or check out books and magazines. Some women have the imagination to think up their own designs. Where do you put your bracelets so you can find the one you want to wear? Bracelets can be stored in a large jewellery box or a decorated mini case or box. Chain bracelets and similar can be hung from hooks. 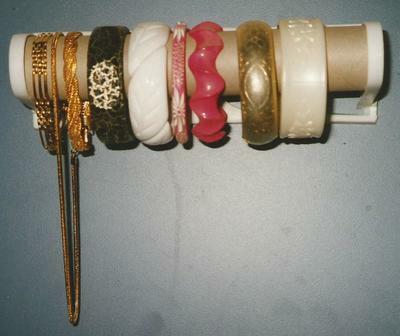 A holder meant for greaseproof paper or cling wrap can be attached to a cupboard or wall in your bedroom and used to store bracelets. However you choose to wear bracelets they are an easy way to express yourself and dress your clothes up or down without spending much money. On the other hand, if you wish to go all out, there are bracelets which cost a small fortune.